Small Business Management 17 Edition Realize your dream for small business success with this market-leading book. 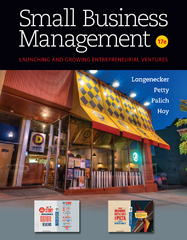 SMALL BUSINESS MANAGEMENT: LAUNCHING AND GROWING ENTREPRENEURIAL VENTURES, 17E provides the practical concepts, entrepreneurial insights, and comprehensive resources you'll find essential both now and throughout your management future. SMALL BUSINESS MANAGEMENT delivers solid coverage of the fundamentals of business management as it teaches you not only how to start a business, but also how to manage, grow, and harvest a business. This market leading text places you in the role of decision maker, allowing you to immediately apply what you've learned to current challenges in today's small businesses. The book's thorough emphasis on building business plans ensures that you can effectively create, manage, and analyze a plan for your own venture. Unforgettable examples, exciting video cases, and coverage of the most current developments in business management today keep this engaging text as current and practical now as it was when it led the market in its first edition 50 years ago. Each edition builds upon past strengths with new innovations and breakthrough developments. SMALL BUSINESS MANAGEMENT: LAUNCHING AND GROWING ENTREPRENEURIAL VENTURES, 17E offers the insights and practical principles that you'll reference again and again throughout your business career. Available with InfoTrac Student Collections http://gocengage.com/infotrac.